Nancy Drew: Message in a Haunted Mansion is rated 4.2 out of 5 by 28. Rated 5 out of 5 by gamesrgreatfun from I Love Nancy Drew Games I have played quite a few Nancy Drew games and I really enjoy the challenge and immersive feeling that I get from them. They are not like any other game I have played and that is a good thing! It is so much fun exploring the different areas to discover the secrets that people are hiding and the secret rooms! I love meeting and talking to the different characters. Some of them are a real hoot! But they all feel like they are real people. For the first hour or so I was completely lost and had trouble finding my way around the B&B and I was wondering why I wanted to play this game. Then things just started making sense and the action started. It had been awhile since I played a Nancy Drew game and it took me some time to get back in the swing of things and how it works. For people who have never played a Nancy Drew game--this is not a Hidden Object game. 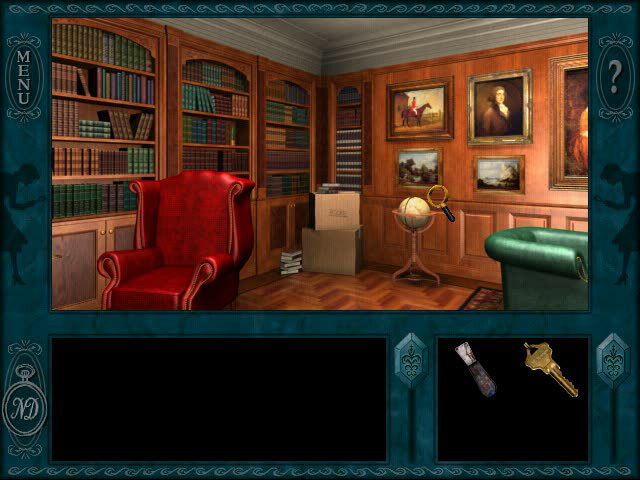 It is an adventure game/ large file game/ point and click game but not a hidden object game. There are no hand-holding techniques such as sparkles, maps, or hint buttons. You are on your own and you must explore the different areas to discover clues as to who the guilty party is and what is happening in the story. Read everything and keep asking questions. Tips for people new to Nancy Drew games: 1) Talk to everyone and ask all the questions that pop up for your side of the conversation. Don't forget to talk to your phone buddies too. Then keep going back and talk to all of them again. 2) Explore EVERYTHING! If the magnifying glass turns red then there is something more to explore or sometimes use an object from your inventory. (You don't have an extensive inventory in this game and once you use an object you still keep it). 3)Take notes. Yes, you need paper and pencil or at the very least a smart phone with a camera to take pics of anything important that you might need later. 4) If you get stuck then call Bess and George and ask them for a clue about what you are supposed to do next. You will still need to use your brain to figure out the next step but they at least point you in the right direction. If you're still stuck go back and talk to everyone again or explore the areas again--you probably missed something. If you are still seriously stuck then go online and look for a walk-through that gives you directions on how to make it through the game. 5) One of the best parts about the Nancy Drew games is the ability to make mistakes--sometimes even fatal mistakes. The game is much more intense and immersive because of this. You are never sure if what you are about to do will be a good thing or a bad thing. After you try it you sometimes discover that it was indeed a bad thing and you get sent home before you finished your job or sometimes even die! But not to worry, there is a Second Chance button that starts you back at the scene before you made the mistake and gives you a chance to try something different that will hopefully give better results. 6) Save your game. Every hour or so and before you quit playing you need to go to the menu and select the Save Game Button. When you restart the game you need to select Load Game and find the name you gave your game from the list and it will take you immediately to the place that you left off in the game. 7) Relax and have fun. The characters you meet can be funny or serious but they all add to the enjoyment of the game. Rated 5 out of 5 by Filia_Lunae from So far so good So far its good, I remember when the Nancy Drew games looked like this. I have been reading Nancy Drew since second grade and playing these since I was about a eleven, its been almost a decade, and I've loved all the ones I've played. However I do like the look of the recent games, with the inventory and stuff. I like that its basically full screen and not half a screen like the early games because the technology was new. I think they should remaster all the old games with the new look, keep all the story line and the way it is written, but give it some tlc so the characters aren't almost cartoony anymore, like how they remastered secrets can kill. But yup so far so good. Rated 5 out of 5 by hrhtx from A Nancy Drew Classic I'd say this one is one of my favorites. I love "haunted" old mansions so this one stuck out to me. I still have the PC disk for this game #though it's only compatible with Windows 95/98# I've been playing Nancy Drew games since the beginning. And I have to say I prefer the older games. Yeah the graphics aren't as great especially with the character models but compared to the first version of Secrets Can Kill it's definitely an improvement. The puzzles though aren't too hard to solve and I took very little notes. I finished this game two times in about 2-3 hours in both Junior and Senior modes. *SPOILER ALERT* The only difference between the two modes are the puzzles near the end of the game where you try and open the pyramid to get the red jewel to get the ending. The different puzzles are the ones with the suns and moons and the sliding puzzle with the phoenix. Rated 5 out of 5 by mygirlsragift from Love Nancy Drew Games Great game to play. Not too hard and not too easy, just right. Rated 5 out of 5 by spenny1 from Solid sleuthing Don't be put off by the fact that this is an older game. You soon get used to the screen layout if you haven't played one of these older ones before, and although the navigation can take a little getting used to, I soon forgot I had even thought about it. I played on senior level, and found the level of challenge just right for me. You still have access to hints through phone calls to your friends. There are plenty of puzzles, riddles to solve, and clues to find. I really felt like I was poking around an old house, looking for clues and answers, with the sort of hidden areas I always wanted to find in real life as a child. The eerie sound effects and 'did I see that?' visuals in a couple of places add to the atmosphere. The characters are well done and the story rolls along nicely. You do have a basic journal in the bedroom, but note taking is imperative for solving the riddles, and helps if you get to a point where you need a reminder of what possible actions you could be taking. All in all, a very enjoyable game, one I'd definitely recommend. 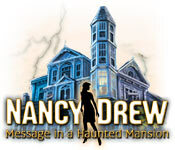 Rated 5 out of 5 by PhillieKat from Love the Nancy Drew games! I usually read the reviews on the Nancy Drew games before purchasing them since you cannot play a trial game first. I really love this game. It is not as frustrating as some ND games can be with memorizing a floorplan to get around. It is a more relaxing game. I have played so many of these games that I am looking forward to new ones coming out. The only thing I wish in the ND games is for the option of skipping some puzzles if you can't get them. Rated 5 out of 5 by Mrs_Kim from Creepy!! Although there are many ND games out there, nothing beats this one in creepiness (well, other than Shadow at Water;s Edge, which has one of the scariest atmosphere in ND games). This one is truly original. I like it that there's seance (and that ND is potrayed dark in that scene), the characters move robotic, and you can't make many conversations with them, but you're basically on your own snooping around the house and 'ghosts' pop out from the corner of your eye in many parts of the game. Exciting, and original. Rated 5 out of 5 by Sergeij from Now This Is "True Drew!" Unlike "Shadow at the Water's Edge" which I finished very laboriously, "Message in a Haunted Mansion" was a masterpiece! 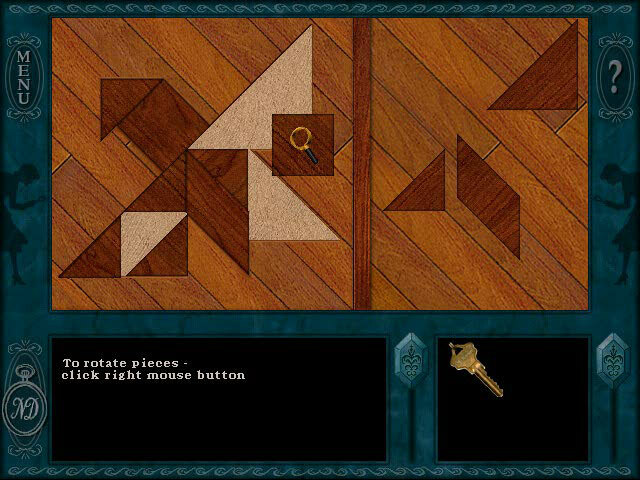 Instead of big, cumbersome puzzles to solve that have NOTHING to do with the story plot, this gem of a game featured riddles and puzzles that were integral to the game. They were tied directly to the plot. I just wish that the new crew of "Nancy techs" could model their future games after this one and not such games as "Shadow," which, to me was a time waster. This was DREW AT ITS BEST! Rated 5 out of 5 by 186FleetStreet from My first Nancy Drew game Oh, wow! This was the first Nancy Drew game I ever played, way back at the end of 2001/beginning of 2002, when I got it as a Christmas present. It's definitely in my top 5 games of the series. Definitely a classic.